Office manager Dani Woolley had been a serial slimmer for years. Weighing in at over 15st210lbs95.3kg, she was often out of breath and felt unhealthy. 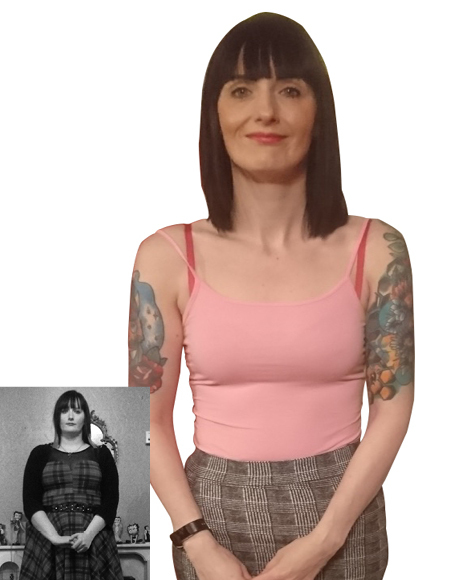 Fed up with feeling sluggish and uncomfortable, Dani vowed to change – and she slimmed down to 9st 13lbs139lbs63kg and now wears a size eight. "I was tired of feeling unhealthy and out of breath – I know some people say you should be happy whatever size you are, but I wasn't happy at all. "I'd had enough. I was stuck in a dress size 16. I'd tried every diet going – the last one was the juice diet – which I stuck at for 2 weeks and it was horrendous! I felt awful and I put the weight I had lost straight back on. "I was having a look for inspiration in the App store and I found Nutracheck. It sounded too good to be true, so I just signed up for a free trial. I lost 4lbs4lbs2kg in that first week, and it was effortless. I was hooked so I signed up for App membership and I've never looked back. "Having to record my calories and seeing it appear in my food diary in black and white really opened my eyes – it was a real light bulb moment for me – and I realised that although I wasn't really eating a lot of food, I was often eating totally the wrong stuff. "My lunch could be something like 3 Twixes and a can of Monster – no surprise I was putting weight on – and now it's likely to be a can of Big Soup or a Subway salad. "I realised that you set yourself up to fail if you cut treats out – so I just downsized to fun size chocolate bars, which gives me enough of a pick me up. I also have a large glass of water before I eat which helps fill me up. "Nutracheck has made me rethink how I eat. I weigh all my food, especially rice and pasta when it's hard to guess what a 'portion' is. Nutracheck has been a great educator for me. Since I started weighing my food, I find I can gauge how much I should be eating just by eyeing it up." The App sounded too good to be true – but it works. I don't think I'll ever be without it on my phone. "I'm not great at getting my 5 a day because I'm not a massive fan of fruit, but I've learned clever ways to eat fruit, like dipping apple slices in peanut butter – it makes a huge difference! "Before I discovered Nutracheck, I'd never counted calories but it takes so little time to do that I've realised it's by far the easiest way to keep track of what I eat. I'm quite good with technology and the app is perfect for me – it's all I need. And I'm not a gym bunny at all, but I do have a dog and we have lots of walks. "I've dropped 4 dress sizes so none of my old clothes fit and I've just given them all away because I'm never going back to how I was! "Before, I would always choose leggings and tunic type tops, and now I'm in skinny jeans which I would never have thought possible. I can wear what I want which is a great confidence booster. "When I make my own food, the App's brill as well – so, if I make a chilli, I just scan the ingredients, portion it and add it to my diary, it's so simple. "One of my weaknesses are crisps, and it has been easy to cut down, not cut out. Because it's so easy to scan food barcodes, it makes you very honest about what you're adding to your diary – there's no hiding from the numbers. "If you can scan a barcode on your phone, you can use this App. It's the easiest way to diet in the world." Never guess portion sizes – always weigh food as calories can easily be seriously underestimated. If ever unsure of anything at all (big or small) always ask questions on the forum – the Nutracheck community is so helpful and friendly and you will always get a lot of helpful tips and advice from the forum. Invest in an activity tracker and aim for 10k steps if possible; I feel this helped to boost my weight loss. Try very hard to drink plenty of fluid – you can mistake hunger for thirst a lot of the time.